Punta Secco, Portovenere. 25cm x 35cm, oil on board. The Palmaria is a small island near the Cinque Terre that lies infront of Portovenere and you can reach it by boat either from La Spezia or from Portovenere. 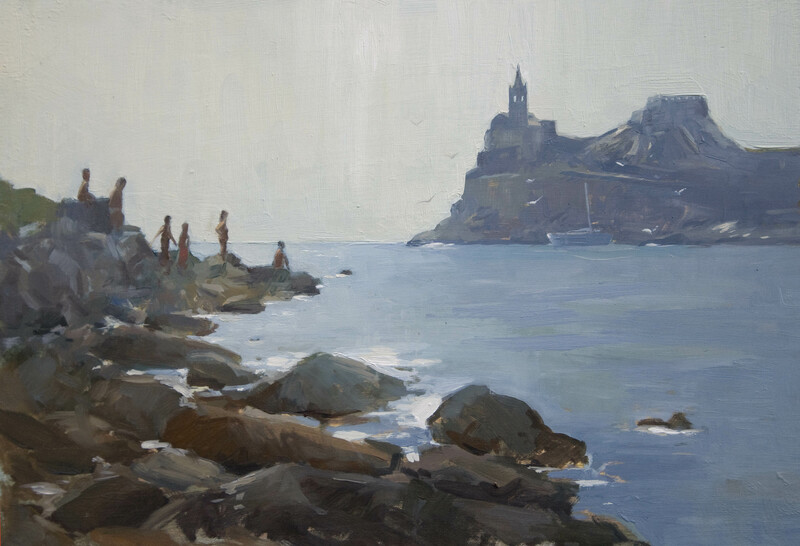 With cool sea breezes and clear, clean blue waters it is by far the best place to be, both for swimming and sunbathing and especially painting. I look forward to going back and walking around the island which you can do in about one hour to search out more painting spots. 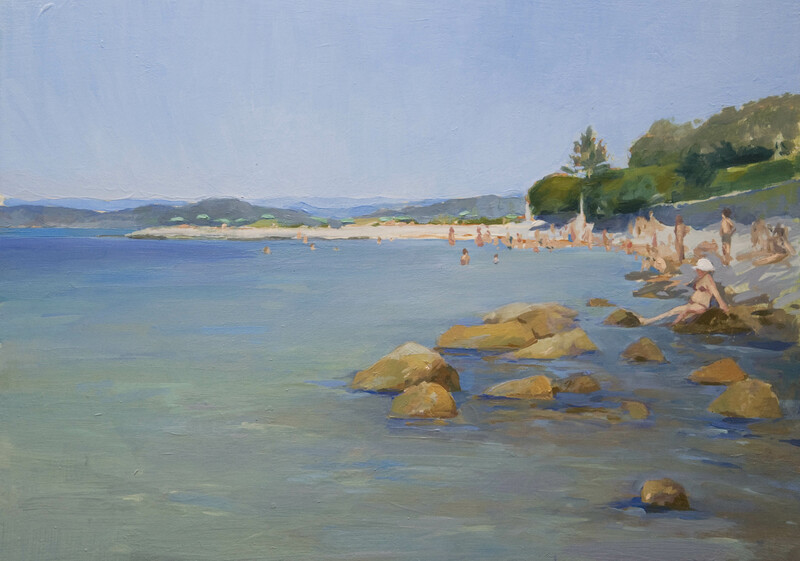 The first painting I did is looking toward the Gabbiano beach in the afternoon, the clear sunny colours and the beach stretching out into the sea inspired me to paint this view. Sunbathers, Portovenere. Oil on board, 25cm x 35cm. The second painting I did while using the same spot and same time of day when I painted the first painting but just turning around 180 degrees. Now the light was coming towards me so the church of San Pietro and the sunbathers were silhouetted against the sky which is an idea I like in this composition probably because the painting process was quicker as I was using a less colourful palette and concentrating mostly on the shapes. Gosh Anna, both paintings are gorgeous! Did you finish these outdoors or did you continue in your studio? Thanks Heidi! Each painting was done on separate occasions not on the same day, (I wish!) . With the first one I didn’t get around to finishing off the rocks and foreground water so I had to finish them off in the studio, and with the second painting I did that mostly outside although when i got home i defined better the outlines of the church and the people which I didnt have time to do. Sometimes my palette gets really messy when Im outside…then I cant clean my brushes properly because the turps has spilt (!!) etc, etc so when I get home its nice to do a bit of re-working! I love your paintings Anna. The atmosphere and translucent water in the first is fantastic. Thanks so much Mary 🙂 I was having so much trouble with the water so I appreciate that you have noticed it looks translucent! Oops I hit enter too soon! I meant to also say- I love the villages of Cinque Terre! I didn’t get to go to Porto Venere when I was there, but I read the book “Beautiful Ruins” which features it prominently!